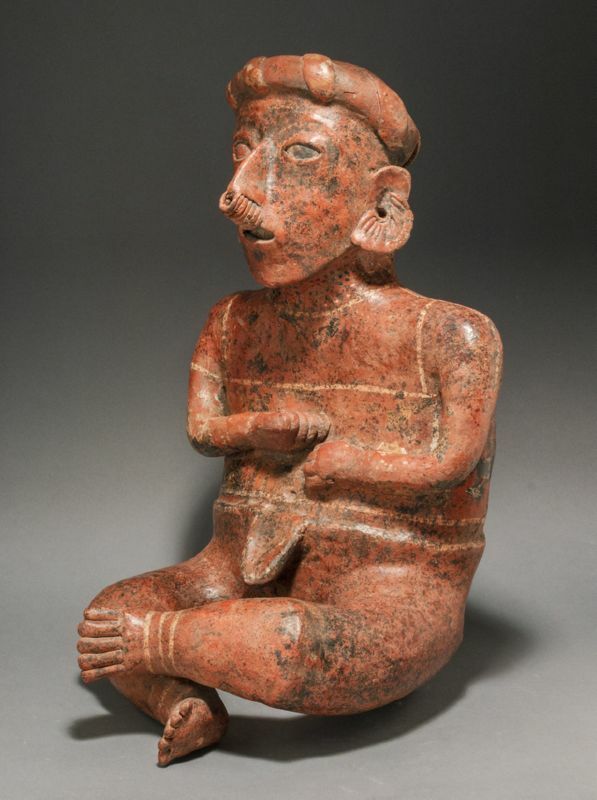 P-3811 A LARGE NAYARIT SEATED MALE FIGURE, IXTLAN DEL RIO TYPE. PROTOCLASSIC, CA. 100 B.C. to A.D. 250. Ancient West Mexico. Ixtlan del Rio Style. Provenance: The Steinberg Family Collection, Los Angeles, and Palm Springs, California, acquired during the 1960s. This finely modeled monumental seated figure, with red slip and creamy white slip decoration, wears the twisted turban headdress, the multiple nose rings and the intricately detailed earrings common to the Ixtlan del Rio types. He also wears a covering probably representing thick leather hanging from the waist, which may indicate that he is a ballplayer, as that type is often shown with a similar protective flap.